The logo for Mudflat Webworks has been borrowed from Bob Lowry's Pelorus Press. Lowry, a legendary figure in New Zealand printing and publishing, was a partner with Ron Holloway in the Unicorn Press before they parted company in 1939, Holloway to establish the Griffin Press, Lowry to begin a succession of Presses inluding Pelorus Press which he operated through the later 1940s. 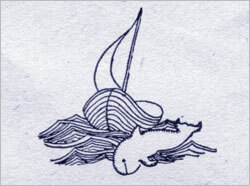 Among the publications of the Pelorus Press was Seven Sonnets, the first publication by Kendrick Smithman (1946), a book which Smithyman himself helped to print (Lowry had taught him the rudiments of printing at Auckland Teachers Colledge in 1940-41); the logo is taken from the title page of a copy of this book. In the 1940s Kendrick Smithyman and his friends Keith Sinclair and Robert Chapman--who all lived in Point Chevalier, a seaside suburb of Auckland, New Zealand--referred to themselves as 'the mudflat poets'.